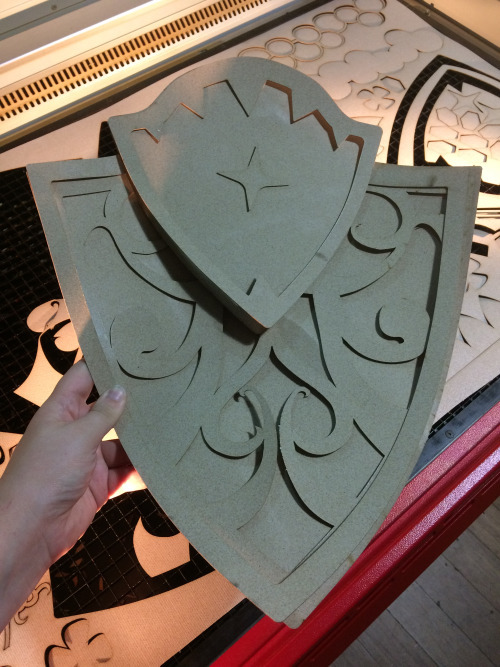 The Dangerous Ladies shared with us their fantastic introduction to lasercutting worbla – so we contacted them to do more and share their findings with us! You can find part one here and part two continues below! Hello, friends! Last time you saw us laser cutting, we did a bunch of stuff with black worbla and the original stuff. The fine people at Worbla and @heatgunning saw this and thought it was super cool, so they invited us to visit their HQ and offered us more worbla to test on, and we said sure, we’d love more excuses to cut things with lasers. Edgar at Toronto Laser Services also thought it was a good time and invited us back to cut more worbla, too, so now we’re a trifecta of lasercut thermoplastics. 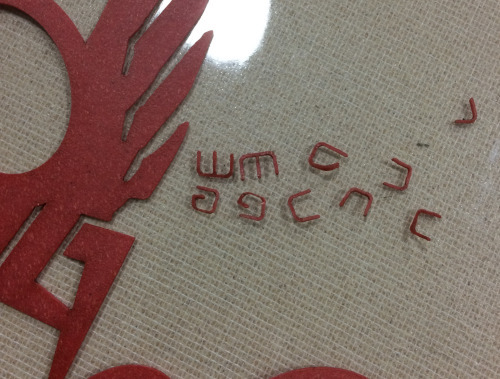 Remind me again, Jenn, what is laser cutting? Getting a robot to do all the grunt work for you because cutting is tedious and is hard on your hands! Hey-oh. 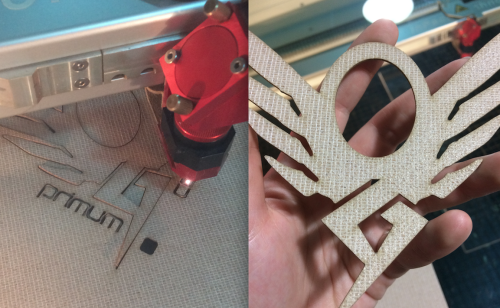 Laser cutting is using a computer-controlled powerful laser to cut or etch materials –– anything from paper to acrylic to wood to metal. It uses vector files to cut perfect lines. It is a godsend. And where does one do laser cutting? We use Toronto Laser Services, but there are likely laser cutting services in just about any major city –– you just have to do some digging. Many of them are set up to serve industrial manufacturing, but many are also artist-friendly, or can be cajoled into experimenting. Either way, I guarantee you virtually none of them have worked with worbla, so these posts we’re making are sort of meant to show hey, this stuff is stable and safe to cut, and these are the best practices to save time. 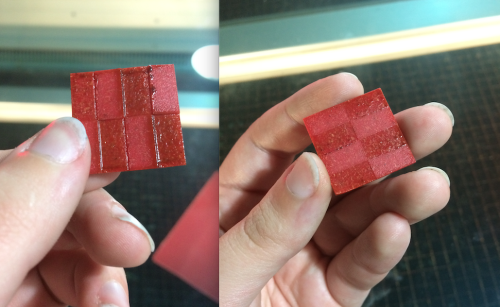 Lasers do best when they’re cutting flat things. You know what often isn’t flat? Worbla. Like 95% of you, we tend to store it in big rolls, and that usually isn’t a problem when you’re just going to heat it up and shape it anyway. It is, however, a growing problem when you need to lay it on the cutting bed flat. 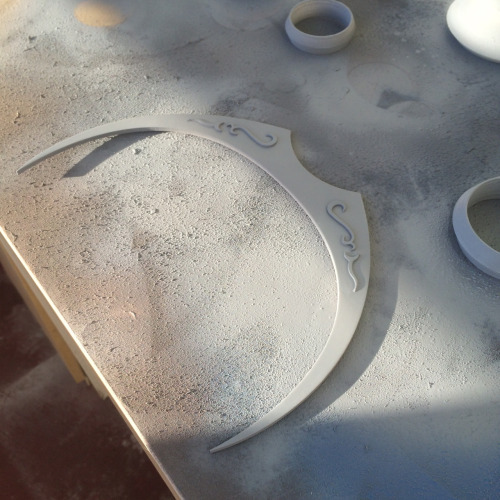 Arcing bits of worbla are likely to be cut ever-so-slightly crooked. The difference here negligible, to my experience, but the more arced it is, the worse the potential for problems. 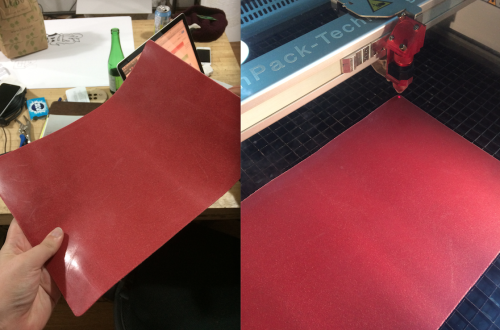 The best preventative measure is to flatten it out completely before you put it in the laser cutter. Roll it the opposite way a few times to get the worst of it out, and then heat it up to get it the rest of the way down. I’ll be honest: trying to find projects to do with transparent worbla is kind of interesting. There’s visors and water effects and fire effects, and there’s making domed pieces to go over lights, but it’s mostly limited by what you wouldn’t paint solid. 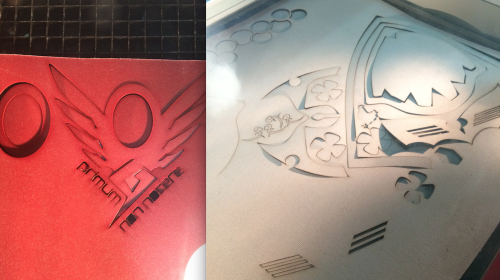 I have a bunch of ideas going forward, but cutting it with the laser actually gave me a bunch of new plans. So how is it to cut it with the laser? TranspArt has the roughest cuts. 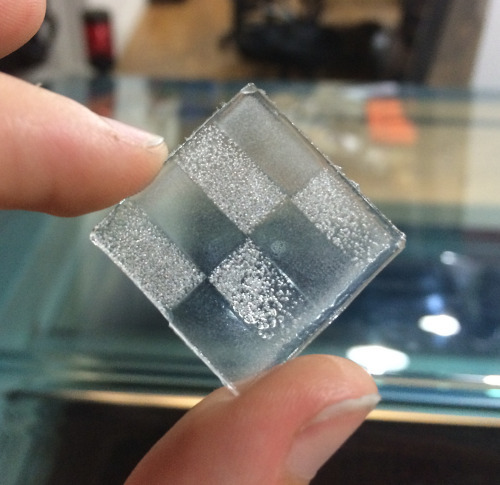 Cutting shapes – especially complex shapes – results in really amorphous, ugly edges with obvious bubbling from melt. While other Worbla cuts very cleanly with minimal to no melted plastic ending up on the cut piece, TranspArt ends up looking melted. Have you ever accidentally hit plastic wrap with your heat gun? Kind of like that. You don’t get clean points, and the tighter your curves, the more likely you’re going to end up with amorphous shapes. 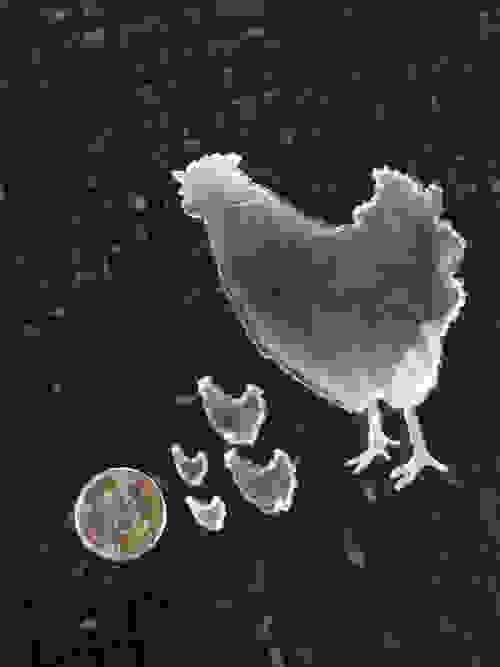 Compare the edge of Flame Red with the TranspArt chickens –– and get ready, you’re going to see a lot of chickens in this post. This melt can also mean removing the cut pieces is a little trickier. 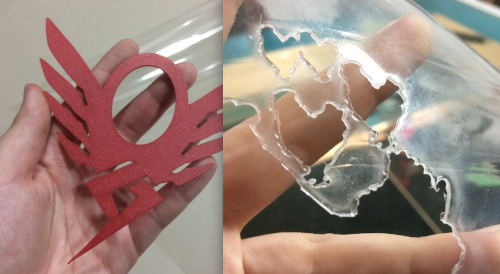 While a cut piece of Mesh or Flame will pop right out of the “frame” (assuming the cut isn’t too tight – more on that later) the Transparent pieces will sort of fuse back together in spots just from the heat of the melting plastic. We had to force the chickens out of their frames once they cooled because they weren’t going to come out otherwise. And very small details? Completely out of the question. Bye, chicken legs! See how there are fewer bubbles on one side than the other? This is because the piece of TranspArt was starting to arc up under the heat, so the laser was touching one side much closer than the other, meaning one side was under more concentrated heat than the other. Be warned! But what’s with those bubbles anyway? 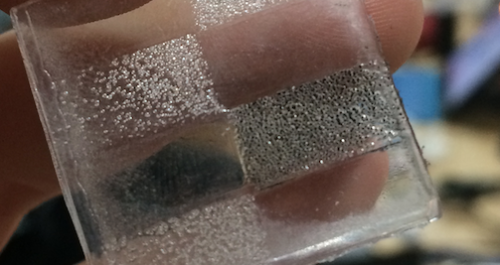 So technically, “engraved” TranspArt isn’t actually engraved; it’s just been nuked, filling it with bubbles. There’s not much texture variation, but visually, it does look pretty neat. I like this effect! When we go back and do some more practical cuts, I’m hoping that we can create pieces that have bubbles strategically “lasered in” to form patterns instead of textures. I’m sure there’s some costume out there that has a practical use for a tiny bubble effect! And because Edgar had Rub n Buff out, he slapped some black on the bubbles to see what happens. It creates a neat little gritty effect; I imagine it could have some neat visual detail. One thing we found, however, is that you need to be prepared for is fogging. 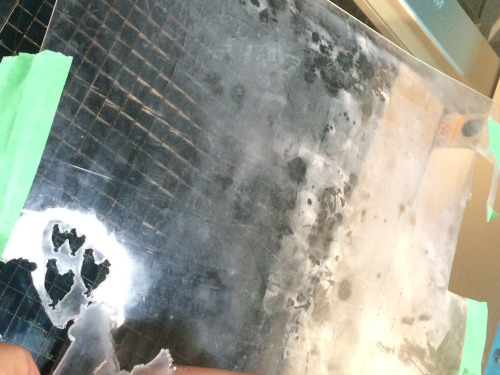 Most materials will produce some sort of smoke when cut as the material is lasered away; in TranspArt’s case, this smoke will tarnish the surface of TranspArt and leave a dusty residue that shows every fingerprint, smudge and imperfection. It wipes away, even with just a brush of your fingers, but be prepared to clean TranspArt pieces in order to restore their clarity. And I doubt I need to say this, but here it goes: don’t lick it. It’s probably gross and Not Good For You. Let’s get this bit out of the way first: Mesh doesn’t etch. Not really, anyway. It just browns immediately, almost regardless of power setting, and it realllllly doesn’t like being stretched after being etched, so I’d skip etching entirely on this one. In the end, the poor etching doesn’t matter, because this stuff is the absolute best to cut. IT JUST CUTS SO CLEAN, PEOPLE! THE EDGES ARE SO NICE! Look at how damn clean that is. Nobody on the planet could cut that clean with scissors. Laser cutters are incredible. But like any material, it still has some little finicky things I thought I’d run over. Mesh is the strongest of the worblas for fine little details, but it still needs some care and caution in the set-up of its files, specifically for really tiny details. The problem with cutting any tiny tiny tiny little layers is that they are likely to fall through the grate and be largely impossible to find. 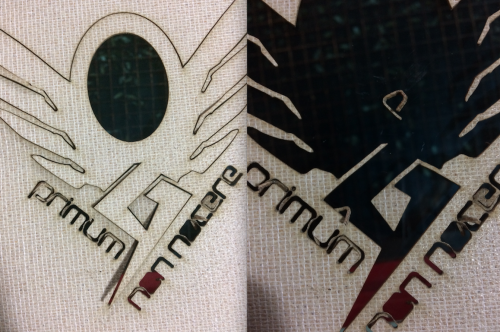 The other problem is that they are going to be slightly thinner than your outline; while you can fiddle with laser settings to reduce burn off, the laser still takes up a certain amount of space, so a letter with a 2mm wide appendage is likely to become 1.5 or 1mm. This might not seem like much, but with the laser doing the whole contour, you’re not going to have much in the way of surviving material. So when cutting letters (or any fine narrow piece), everything needs breathing room, not just for the laser but for the heat. Heat radiates through worbla more than something like wood, so if you have two letters side by side, the clearance might be enough for the laser but still so close that the heat warps the next letter. See how this gap between the letters looks wide enough, and is wide enough that the laser doesn’t overlap, but the fallout for the laser’s heat has warped them slightly? That little bar between the letters is toast, and it did a number on the letters, too. While we CAN cut those fine little letters, they’ll survive better if we space them out more and wait for them to cool completely before handling them –– after all, there’s nothing saying we HAVE to cut everything arranged how it will be assembled. Doing fine little details with worbla is stellar, though. It’s a rigid material so it survives sanding and whatnot without losing shape, while other thin materials like craft foam could just tear and need to be sealed. So I did the filigrees on Lucina’s tiara with laser cut black worbla — tiny fine little points are maintained, and adding it to the piece is just a matter of gently heating and applying. Finishing is just a few layers of primer and sanding. Incredibly clean little details!! This took about 3 minutes to cut –– probably not even. All I’d have to do is back it on something more rigid for durability and voila. I have a shield! It’s fire-retardant and red. Otherwise, it seems a great deal like black worbla. It cuts like black worbla, too –– very clean! –– but it puts off far less smoke when it cuts. That’s always nice. It is neat to etch, too. It gets a little melty if you turn up the power too high, but at low levels it does some neat stuff. (Funny enough but unpictured, you can sort of see it through the back – the heat discolours it slightly.) I’m not sure what kind of use this could have, as the finishing techniques that people use on worbla would decimate this kind of etching, but it’s Fun To Know. Fun story: it also takes to tiny letters a fair bit better than others, in my opinion, because it tolerates heat quite a bit better than some other worblas. On the right settings, it cuts pretty finely without warping. This might be the worbla of choice for teeny tiny details. Still a tiny bit mangled, though. Did I mention you should wait until it cools completely before handling it? I have so many more posts to write, guys. I have so much information and this is so long already.